There was a palpable sense of jealousy as Chandrika Prasad completed his narration. And the elders in the audience exhaled, “achhaa?” The “achha”, while being affirmative, was also part incredulous and part jealousy; the latter being more dominant. The elders were my mamas and the others were kids, with yours truly as an active listener. Chandrika Prasad’s story was indeed stupefying. He, a village bumpkin, enlisted into the Indian army. He was posted in the North East but longed to get home to his ancestral village in Choubeychak. Which he did, after taking a premature retirement. He chose to travel home via a flight to Calcutta, and not the boringly-long train journey. He claimed that he had developed a headache on the flight which was relieved only with a prompt and altogether relaxing forehead massage by a friendly air-hostess. And that is what raised the hackles of my mamas who were all his compatriots. Chandrika Prasad, how did he get so lucky? Not only he flew, he was the first one in the village (and the neighbouring ones) to take a flight- this was in the early 70’s. And then he received the ministrations of an air-hostess! Chandrika’s father, Jangi Thakur was my Nana’s age. Jangi was of Nana’s age, and he was a bosom buddy of nana’s younger brother, Manori Choubey. Jangi would address Manori by his name though he dare not utter my nana’s name. After all, Kapildeo Choubey, my nana, was the famed Sanskrit scholar in the area. Jangi called him Baba. Like all other men of “lower” castes. Jangi belonged to the barber community. Jangi was a nau, of the barber caste. Also called derisively by the upper caste folks, a nauwwa. Jangi’s sons were of a similar age as my nana’s offspring, and his kids- Chandrika Prasad included- were as old as my mamas. Brahmins and the barber caste folks in the villages shared a symbiotic relationship. Brahmins would preside over rituals of a Hindu family, birth, mundan, shaadi, death ceremony etc. No ritual was complete without either the brahmin or the barber. The barber was enlisted to travel far-and-wide for match-making and the Brahmin was required to solemnize them. Even during the wedding ceremony the roles of the two were defined, and critical. Each barber was “attached” to a Brahmin, and vice versa. One would flourish only if the other did. The extent of inter-dependence extended to the female in the nau family, to the naoon. She was required for rituals right from a woman’s marriage to her husband’s death. This has been mentioned in the following kahawat. Such is the role of the barber community in the Brahmin society. Brahmins were relatively more prosperous in the community and certainly more respected; so a Brahmin family had a barber family “attached” to its household. Like Pandit Kapildeo Choubey, my nana, had Jangi Thakur’s family as neighbours. Jangi, his wife and their four sons; Chandrika Prasad was the youngest. While Chandrika was his real name, the world knew him as “Loolha”, one with a maimed forearm. He was not physically challenged, else he could not have gone into the Indian army. Apparently, when he was being delivered from his mother’s womb, Chandrika decided to do something unconventional. Instead of popping out head-first, he emerged hands-first. And it is the prominence of his hands, ironically, which got him the nick loolha. Rather inappropriate for one who “raised his hands first”, would you not agree with me! Loolha was my mamas’ playmate, schoolmate and partner in sundry family activities. He would address them by their first names, just as they would call him Loolha. The whole village called him Loolha. Chandrika was his name in school and Loolha was his pet name. Loolha was born to be rebellious. For starters, he refused to take on his family vocation of a barber; he enlisted into the army! When he did so, my nana’s family was aghast. More so Loolha’s childhood friends, my mamas; all of whom had now become school teachers or government servants. They would say, “So a barber is now taking on the role of a Rajput? God save our nation!” And when the news came that Loolha had quit the army, my mamas were gloating. Looks of “I-told-you-so” writ large on their faces. And how these faces fell when they heard of his travel from the North-East by flight. They could have written this off as yet another tall tale by Loolha, except that the story was much in detail and none of my mama’s had ever travelled on a flight- in fact none on the family had in those days of early 70’s- to even begin picking holes in Loolha’s story. If there was anyone in nana’s family Loolha was close to it was mai, my mother. The eldest of the offspring in nana’s family and hence elder to all the mamas. Loolha would address her just as my mamas did with the informal but respectful didiya or bahiniya. To her he told the story about why he left the army, he wanted a white-collared job just like any of my mamas. And to this end, he camped in Jamshedpur where my mother and most of my mamas were located. It was difficult for an undergraduate to get any job, least of all a white-collared on. And more so for someone with an army background. Loolha tried his best, but jobs were just not forthcoming. Loolha would come home every evening to pour out his woes to his didiya. He would either sit respectfully on the floor or would pull out a broken chair which was kept aside in the house for people of his ilk, those of “lower” castes. He would narrate his travails of the day, sip on the cup of tea offered to him and go way after an hour or so. Sometimes his visit to his didiya would coincide with one of my mamas trips. Mamas would take pity on him and suggest pundits he could get attached with and earn a living playing the role of a traditional barber. Loolha, of course, would have none of it! He wanted a white-collared job. Never to give up hope, he applied for a job as a security guard at the State Bank of India and he was selected, thanks to his fauji credentials. As luck would have it, he was posted in an SBI branch close to our house! Over time he wrote a test for internal promotions and was selected as an assistant cashier. His joy knew no bounds and I remember that from his first salary he bought mai a saree. “I have now become a sahab, didiya! Did I not tell you I will become “something” in life!” My mamas were not too happy but they did not forget to congratulate him. Loolha would come every other day and regale us with tales of his new-found sahab status. And so-on-and-so-forth he continued. He obviously was enjoying his new found status. There was some unwritten code in the family which prevented us from calling him mama. You are all so intelligent. When you grow up you will become officers. Will you then remember us then? Over time, I left Jamshedpur to pursue higher studies. Loolha was largely forgotten but for those post-script kind of information bits in the letters from home. Like Loolha’s eldest son is getting married. Loolha has now become a grandfather etc. When I would visit home for the vacations, Loolha would show up and ask my advice on what his sons ought to be doing to further their career prospects. And then one of those post-scripts in the letters from home informed me that Loolha had resigned from his job as a cashier in the bank he worked with. I did not give it a thought even for a moment. There were other things to contend with in the campus. I discovered later that ambition of a good life got the better of Loolha’s senses. He wanted to have a better house in his village so he sent money “home” to his under-employed brothers for that. To be sure much of it was appropriated by them. The brothers’ kids needed to be married, who better to fund the weddings than Loolha who was now an officer in a great bank! Loolha volunteered cash again. Loolha had to educate his own children in schools and colleges across the country (after all a sahab’s sons needed the best of education, never mind their intellectual caliber or the financial resources at disposal. They had to match up to didiya’s sons). And the he had to marry them off. As a consequence of all this Loolha progressively took on a huge loan. When the interest burden spun into an outward spiral, the only recourse left to him was to resign his job and use the provident fund money to repay his debts. He was pretty sure that with his accounts background he would get a good job in any of the private companies in the city. Maybe a job which paid him more than what he earned at the bank. No luck for Loolha on that front. He continued to be jobless and continued to pile up loans, often from his favourite Didiya. I rarely attend marriages in my extended family, but I made an exception for one of my favourite cousins acouple of years ago. That is where I met Loolha after many years. He had travelled with the other baraatis not as a nau, mind you, but as a proper baraati. All my mamas had gathered there as well. The baraatis were lazing around in the janwaaasa enjoying the hospitality of the bride’s family, catching up on news, eating and drinking and generally having a good time. Loolha was also hanging around watching the proceedings. Till one of my mamas decide to have some fun at the expense of Loolha. “Just for this wedding, will you take charge of the maoor. 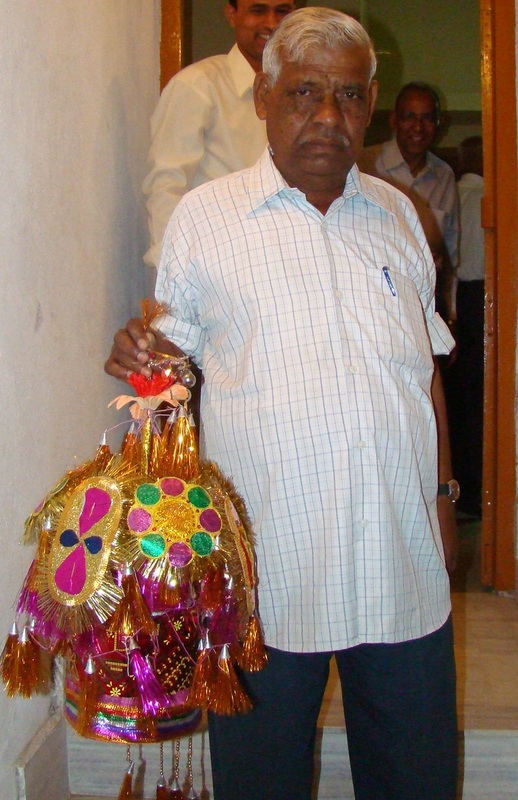 Maoor is the Bhojpuri word for the unwieldy crown worn by the groom. It is the job of the nau to ensure that the maoor is held firmly on the groom’s head and when the maoor is not worn, then to keep it in his possession. Loolha was being asked to the role of a nau, something which he stayed away from all his life. He did not quite know how to react. And then another mama joined in. Before Loolha could utter anything, someone shouted. “This bada sahab has come all the way from Bangalore to Patna to attend this wedding. He is even carrying his fancy camera. He wants to shoot your pics.” It took me a moment to realize that the bada sahab being referred to was me. And without any further ado, and before I could say anything, Loolha got on the job with the maoor. That was the last time I met Loolha. Loolha died last year of a heart attack even before he could turn sixty. Pride coupled with poverty did him in. You are currently browsing the Santosh Ojha's Weblog blog archives for December, 2010.